This is the type of horror novel that sneaks up on you in the middle of the night and stares at you while you sleep. Hex has some Under the Dome and Pines vibes going for it, maybe even a little bit A Head Full of Ghosts, but is truly a fantastic original. Oh, and I’m a sucker for blurbs by some of my fav authors. Sue me. Imagine moving to or growing up in a town where you aren’t allowed to leave, for fear that something or someone spreads. Where a simple vacation can lead to thoughts of suicide or mass murder. A town where 24/7 surveillance is a must-have for fear of the outside world finding out its secret. Black Spring, located in Hudson Valley, is such a town because it is haunted by the Black Rock Witch, a 17th century woman with eyes and mouth sewn shut. She enters residences at random, lingers for periods of time, and just disappears. The townsfolk make light of the situation by throwing towels or sheets over her while she is in their homes, but some teenagers in the small town are becoming increasingly agitated by her presence and decide it’s time to do something. As the kids begin shooting video of her and uploading it to the internet, horrors beyond imagination begin to creep up around Black Spring and the consequences become more than they can handle. While the beginning of Hex pulls you into a picturesque town with happy, warm homes and loving families, the meat of the story hits you with tension and dread, while the end is a sucker punch to the gut. Picture the Brady Bunch having a lovely sit-down dinner, only to a have sewn-up, 17th century corpse walk into their kitchen and just linger; and when they try to do something about her presence in their home, all heck breaks lose. But not everyone in the town wants her gone as there are a couple of sympathetics around, just giving the entire dynamic of the town a boost. Some of the characters leave a bit to be desired, but you will feel so much for the people of the town because they have to live with this realization every..single…day that it doesn’t take away from the story. The overall sense of dread and the atmosphere of the novel are what will grip you and make this a truly fun novel to read. I will also say that I listened to the audio by this one and, while I was a fan Jeff Harding for his rendition of ‘Kings of the Wild’ by Nicholas Eames, I wasn’t as impressed with his work on Hex. He has a great voice, but I don’t believe he captured everything needed to make this audiobook fantastic, especially with some of the female voices. All in all, this is definitely a great book to pick up for horror lovers and those of us who see the downsides of social media/millennials… haha. 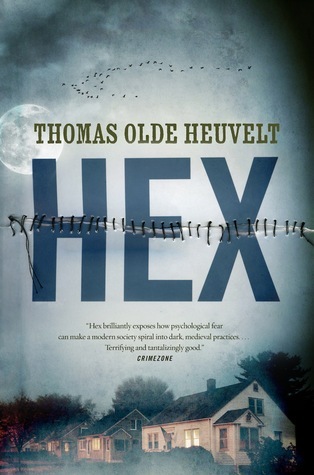 But really, I thoroughly enjoyed Hex, especially that crazy ending, and I think you will too.